If the employee has no TIN (Tax Identification Number), he/she shall file a BIR form 1902 to the Revenue District Office (RDO) where the principal place of business is registered. If the employee has a TIN, he/she shall submit BIR form 2305 to the same RDO to update the BIR of his/her new employment. If previous employer is located in a different RDO, he/she shall submit a BIR form 1905 in the RDO where his/her previous employer is registered. Monthly contributions are deducted based on their actual monthly salaries, 30% of which is deducted to the employee and 70% is subsidized by the employer. 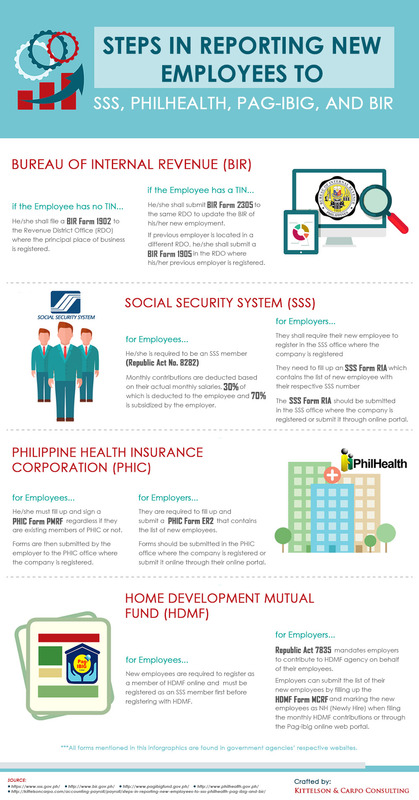 For employers, they shall require new employee to register in the SSS office where the company is registered. They need to fill up an SSS Form R1A which contains the list of new employee with their respective SSS number. The SSS Form R1A should be submitted in the SSS office where the company is registered or submit it through online portal. For employees, he/she must fill out and sign a PHIC form PMRF regardless if they are existing members of PHIC or not. Forms are then submitted by the employer to the PHIC office where the company is registered. For employers, there are required to fill out and submit a PHIC Form ER2 that contains the list of new employees. Forms should be submitted in the PHIC office where the company is registered or submit it online through their online portal. For employees, new employees are required to register as a member of HDMF online and must be registered as an SSS member first before registering with HDMF. For employers, Republic Act 7835 mandates employers to contribute to HDMF agency on behalf of their employees. Employers can submit the list of their new employees by filling up the HDMF Form MCRF and marking the new employees as NH (New hire) when filling the monthly HDMF contributions or through the Pag-ibig online web portal.